19.4.6 The polite fiction of !! More accurately predict the performance and memory usage of your code. Write faster code by avoiding accidental copies, a major source of slow code. Better understand R’s functional programming tools. The goal of this chapter is to help you understand the distinction between names and values, and when R will copy an object. Answer the following questions to see if you can safely skip this chapter. You can find the answers at the end of the chapter in Section 2.7. Given the following data frame, how do I create a new column called “3” that contains the sum of 1 and 2? You may only use $, not [[. What makes 1, 2, and 3 challenging as variable names? In the following code, how much memory does y occupy? On which line does a get copied in the following example? Section 2.2 introduces you to the distinction between names and values, and discusses how <- creates a binding, or reference, between a name and a value. Section 2.3 describes when R makes a copy: whenever you modify a vector, you’re almost certainly creating a new, modified vector. You’ll learn how to use tracemem() to figure out when a copy actually occurs. Then you’ll explore the implications as they apply to function calls, lists, data frames, and character vectors. Section 2.4 explores the implications of the previous two sections on how much memory an object occupies. Since your intuition may be profoundly wrong and since utils::object.size() is unfortunately inaccurate, you’ll learn how to use lobstr::obj_size(). Section 2.5 describes the two important exceptions to copy-on-modify: with environments and values with a single name, objects are actually modified in place. Section 2.6 concludes the chapter with a discussion of the garbage collector, which frees up the memory used by objects no longer referenced by a name. We’ll use the lobstr package to dig into the internal representation of R objects. The details of R’s memory management are not documented in a single place. 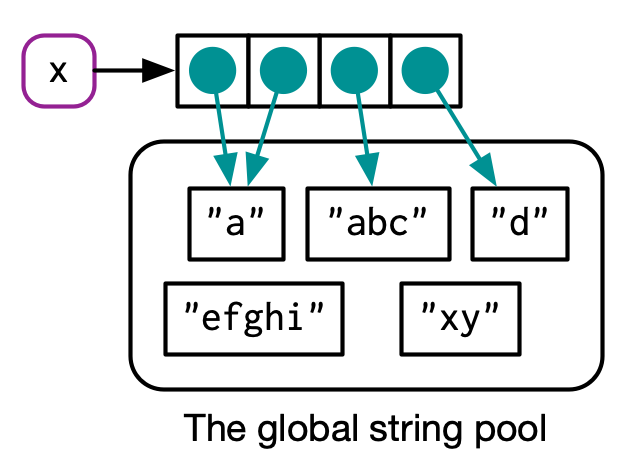 Much of the information in this chapter was gleaned from a close reading of the documentation (particularly ?Memory and ?gc), the memory profiling section of Writing R extensions (R Core Team 2018b), and the SEXPs section of R internals (R Core Team 2018a). The rest I figured out by reading the C source code, performing small experiments, and asking questions on R-devel. Any mistakes are entirely mine. It’s creating an object, a vector of values, c(1, 2, 3). And it’s binding that object to a name, x. In other words, the object, or value, doesn’t have a name; it’s actually the name that has a value. The name, x, is drawn with a rounded rectangle. It has an arrow that points to (or binds or references) the value, the vector c(1, 2, 3). The arrow points in opposite direction to the assignment arrow: <- creates a binding from the name on the left-hand side to the object on the right-hand side. 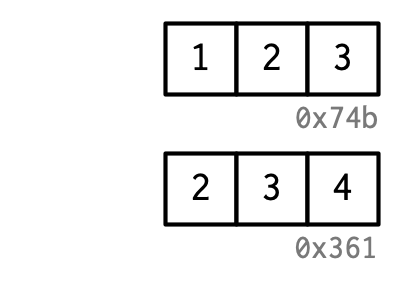 You might have noticed that the value c(1, 2, 3) has a label: 0x74b. While the vector doesn’t have a name, I’ll occasionally need to refer to an object independent of its bindings. To make that possible, I’ll label values with a unique identifier. 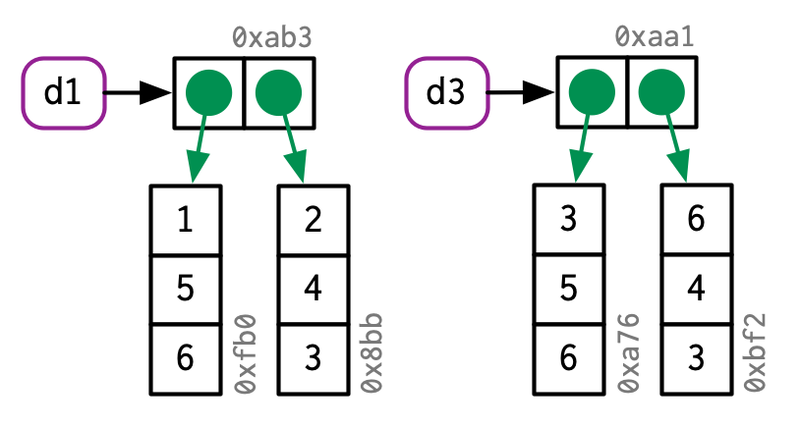 These identifiers have a special form that looks like the object’s memory “address”, i.e. 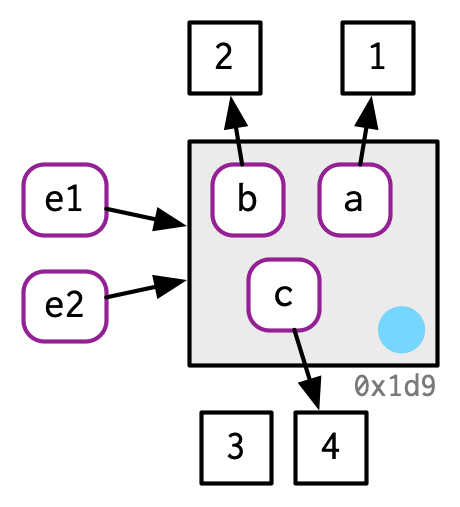 the location in memory where the object is stored. But because the actual memory addresses changes every time the code is run, we use these identifiers instead. These identifiers are long, and change every time you restart R.
It can take some time to get your head around the distinction between names and values, but understanding this is really helpful in functional programming where functions can have different names in different contexts. #> Error: unexpected input in "_"
#> Error: unexpected assignment in "if <-"
While it’s unlikely you’d deliberately create such crazy names, you need to understand how these crazy names work because you’ll come across them, most commonly when you load data that has been created outside of R.
You can also create non-syntactic bindings using single or double quotes (e.g. "_abc" <- 1) instead of backticks, but you shouldn’t, because you’ll have to use a different syntax to retrieve the values. The ability to use strings on the left hand side of the assignment arrow is an historical artefact, used before R supported backticks. The following code accesses the mean function in multiple ways. Do they all point to the same underlying function object? Verify this with lobstr::obj_addr(). What rules does make.names() use to convert non-syntactic names into syntactic ones? I slightly simplified the rules that govern syntactic names. Why is .123e1 not a syntactic name? Read ?make.names for the full details. Consider the following code. It binds x and y to the same underlying value, then modifies y3. Modifying y clearly didn’t modify x. So what happened to the shared binding? While the value associated with y changed, the original object did not. Instead, R created a new object, 0xcd2, a copy of 0x74b with one value changed, then rebound y to that object. This behaviour is called copy-on-modify. Understanding it will radically improve your intuition about the performance of R code. A related way to describe this behaviour is to say that R objects are unchangeable, or immutable. However, I’ll generally avoid that term because there are a couple of important exceptions to copy-on-modify that you’ll learn about in Section 2.5. When exploring copy-on-modify behaviour interactively, be aware that you’ll get different results inside of RStudio. That’s because the environment pane must make a reference to each object in order to display information about it. This distorts your interactive exploration but doesn’t affect code inside of functions, and so doesn’t affect performance during data analysis. For experimentation, I recommend either running R directly from the terminal, or using RMarkdown (like this book). If you modify y again, it won’t get copied. That’s because the new object now only has a single name bound to it, so R applies modify-in-place optimisation. We’ll come back to this in Section 2.5.
untracemem() is the opposite of tracemem(); it turns tracing off. # there's no copy here! You’ll learn more about the conventions used in this diagram in Section 7.4.4. In brief: the function f() is depicted by the yellow object on the right. 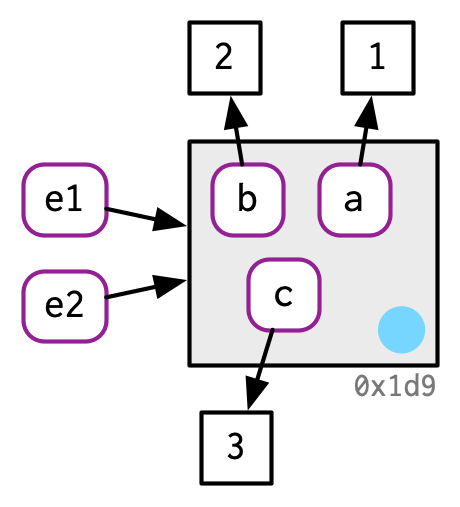 It has a formal argument, a, which becomes a binding (indicated by dotted black line) in the execution environment (the gray box) when the function is run. Once f() completes, x and z will point to the same object. 0x74b never gets copied because it never gets modified. If f() did modify x, R would create a new copy, and then z would bind that object. Like vectors, lists use copy-on-modify behaviour; the original list is left unchanged, and R creates a modified copy. This, however, is a shallow copy: the list object and its bindings are copied, but the values pointed to by the bindings are not. The opposite of a shallow copy is a deep copy where the contents of every reference are copied. Prior to R 3.1.0, copies were always deep copies. To see values that are shared across lists, use lobstr::ref(). 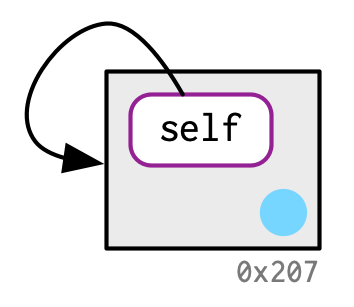 ref() prints the memory address of each object, along with a local ID so that you can easily cross-reference shared components. This has a profound impact on the amount of memory a character vector uses but is otherwise generally unimportant, so elsewhere in the book I’ll draw character vectors as if the strings lived inside a vector. Why is tracemem(1:10) not useful? 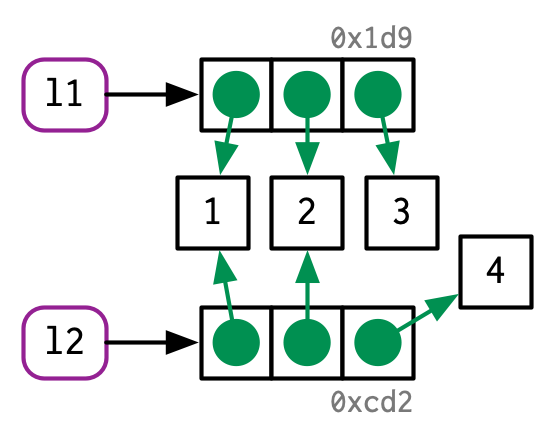 Explain why tracemem() shows two copies when you run this code. Hint: carefully look at the difference between this code and the code shown earlier in the section. What happens when you run this code? Similarly, because R uses a global string pool character vectors take up less memory than you might expect: repeating a string 1000 times does not make it take up 1000 times as much memory. banana <- "bananas bananas bananas"
In the following example, why are object.size(y) and obj_size(y) so radically different? Consult the documentation of object.size(). Take the following list. Why is its size somewhat misleading? 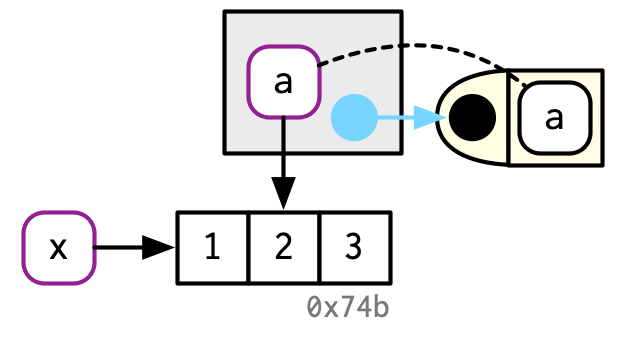 Objects with a single binding get a special performance optimisation. Environments, a special type of object, are always modified in place. When it comes to bindings, R can currently7 only count 0, 1, or many. 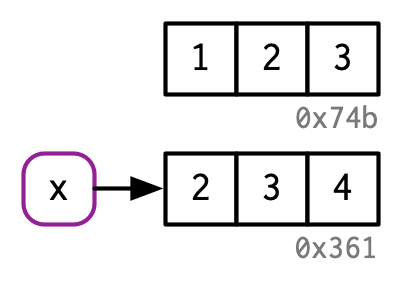 That means that if an object has two bindings, and one goes away, the reference count does not go back to 1: one less than many is still many. In turn, this means that R will make copies when it sometimes doesn’t need to. Whenever you call the vast majority of functions, it makes a reference to the object. The only exception are specially written “primitive” C functions. These can only be written by R-core and occur mostly in the base package. Together, these two complications make it hard to predict whether or not a copy will occur. Instead, it’s better to determine it empirically with tracemem(). 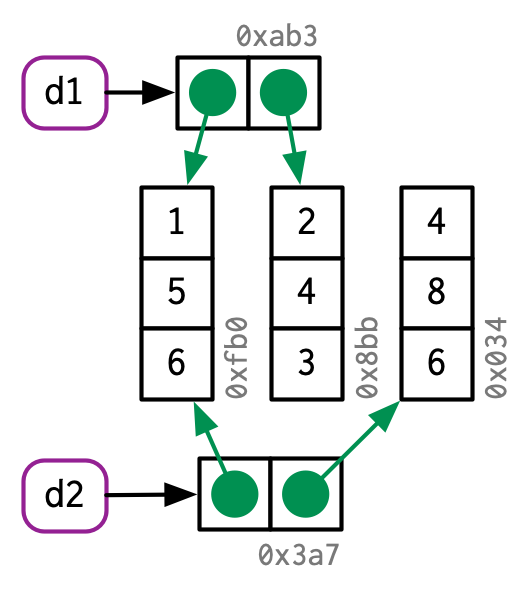 In fact, each iteration copies the data frame not once, not twice, but three times! 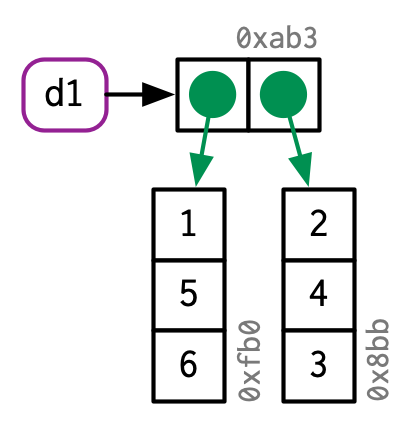 Two copies are made by [[.data.frame, and a further copy8 is made because [[.data.frame is a regular function that increments the reference count of x. While it’s not hard to determine when a copy is made, it is hard to prevent it. If you find yourself resorting to exotic tricks to avoid copies, it may be time to rewrite your function in C++, as described in Chapter 25. You’ll learn more about environments in Chapter 7, but it’s important to mention them here because their behaviour is different from that of other objects: environments are always modified in place. This property is sometimes described as reference semantics because when you modify an environment all existing bindings to that environment continue to have the same reference. This basic idea can be used to create functions that “remember” their previous state. See Section 10.2.4 for more details. This property is also used to implement the R6 object-oriented programming system, the topic of Chapter 14. This is a unique property of environments! Explain why the following code doesn’t create a circular list. Wrap the two methods for subtracting medians into two functions, then use the ‘bench’ package (Hester 2018) to carefully compare their speeds. How does performance change as the number of columns increase? What happens if you attempt to use tracemem() on an environment? We created two objects, but by the time the code finishes, neither object is bound to a name. How do these objects get deleted? That’s the job of the garbage collector, or GC for short. The GC frees up memory by deleting R objects that are no longer used, and by requesting more memory from the operating system if needed. R uses a tracing GC. This means it traces every object that’s reachable from the global9 environment, and all objects that are, in turn, reachable from those objects (i.e. the references in lists and environments are searched recursively). 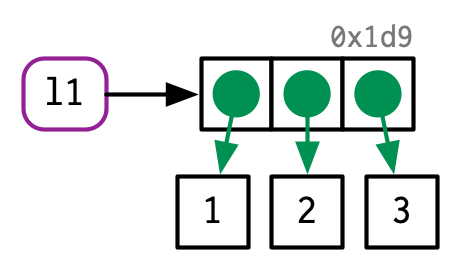 The garbage collector does not use the modify-in-place reference count described above. 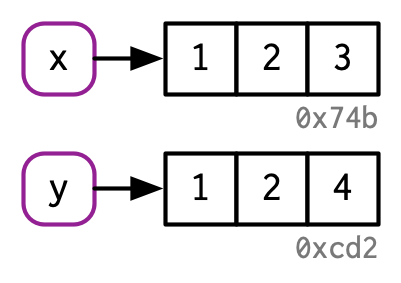 While these two ideas are closely related, the internal data structures are optimised for different use cases. 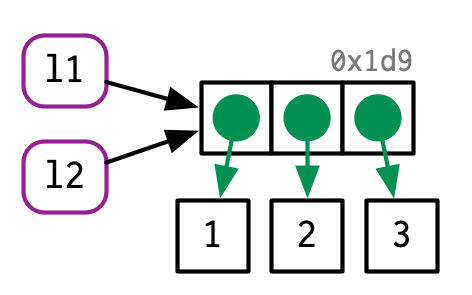 The garbage collector (GC) runs automatically whenever R needs more memory to create a new object. Looking from the outside, it’s basically impossible to predict when the GC will run. In fact, you shouldn’t even try. If you want to find out when the GC runs, call gcinfo(TRUE) and GC will print a message to the console every time it runs. It includes objects created by R but not by the R interpreter. R counts the memory occupied by objects but there may be empty gaps due to deleted objects. This problem is known as memory fragmentation. You must quote non-syntactic names with backticks: `: for example, the variables 1, 2, and 3. It occupies about 8 MB. a is copied when b is modified, b[] <- 10. R Core Team. 2018b. “Writing R Extensions.” R Foundation for Statistical Computing. https://cran.r-project.org/doc/manuals/r-devel/R-exts.html. R Core Team. 2018a. “R Internals.” R Foundation for Statistical Computing. https://cran.r-project.org/doc/manuals/r-devel/R-ints.html. Hester, Jim. 2018. Bench: High Precision Timing of R Expressions. http://bench.r-lib.org/.